Anne Hillerman, the daughter of writer Tony Hillerman, is an established writer in New Mexico and the Southwest, having published 8 non-fiction works since 1983. In 2013, Anne Hillerman picked up the threads of her father’s substantial legacy with the publication of Spider Woman’s Daughter. The novel progresses the plot line of Diné detectives Joe Leaphorn, Jim Chee and Bernadette Manuelito. Hillerman sought to provide a corrective in her father’s work. Anne notes she was bothered by the narrative of Bernadette “mostly getting rescued” and endeavored to pen a western “where Bernie saves the day.” Ms. Hillerman continues her literary efforts, publishing Rock with Wings in 2015, another in the Leaphorn and Chee series set against the magnificent backdrop of Monument Valley. Song of the Lion, her third work of fiction, went to press in 2017. 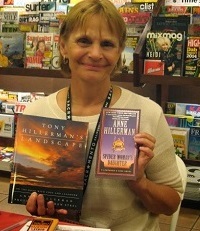 Now the bibliography of Anne Hillerman's work is available online on the Tony Hillerman Portal. The portal team is also working to host the manuscripts for Anne Hillerman's novels. Click here to visit the Anne Hillerman section of the Hillerman Portal.